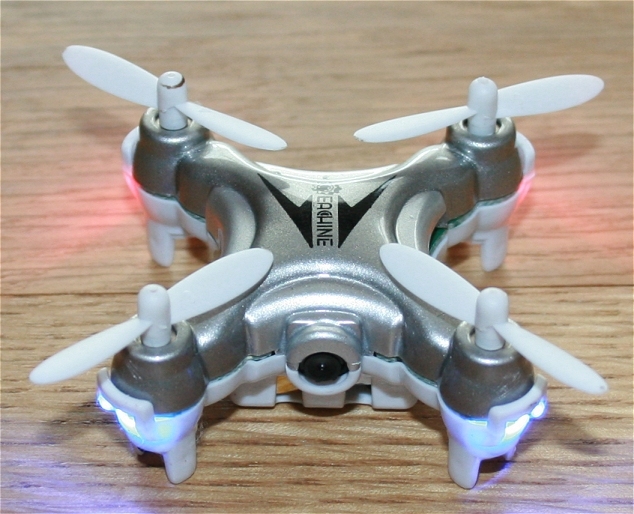 I have chosen to take a look at the Mini Nano Drone with a 720p HD camera built into it. This quadcopter is not actually something I had thought about getting hold of until I actually saw one. The tiny size of the drone makes it extremely appealing to me as realistically I just wanted to mess around with one indoors rather than spend a fortune buying the latest tech and making outdoor videos for the net. Prior to this, I have had a total of 5 of those small helicopters which appeared earlier on the market, I had a lot of fun with those but kept breaking them – so with this, I am hoping for a bit more control and enjoying the added potential fun of recording with the video camera whilst in flight. The first thing that hit me about this model by Eachine (E10C) is it size. I mean this is a very very small and mini nano drone. When I opened the box and saw it (although I had seen the photos online already) it knocked me for six! How on earth do they get a camera, battery and motors – along with the remote control sensors into such a tiny bit of kit? Removing the drone from the box I actually got a good sense of weight from it although I did get the impression it was delicate, so I handled it carefully so as not to damage the propellers. On inspection, the charge connection is pretty much identical to those on the small polystyrene copters I used to have, and it came without a 5v charger, instead mentioning that you need to connect it to a PC usb port for charging and NOT a wall mounted plug. Quite why this is the case is unclear – but never stray from the instructions the manufacturer provides – especially where lithium ion batteries are of concern. 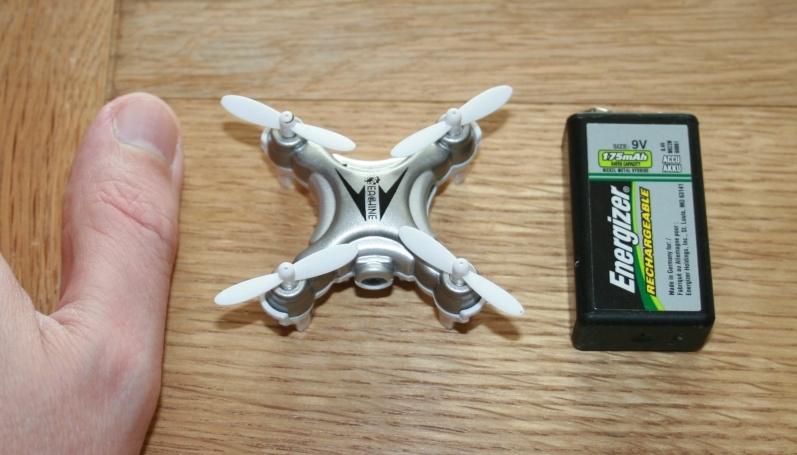 Here is a photo of the Nano Drone I am looking at. So just how “Nano” is this Nano drone? Well, in the photo above it looks quite large, well looks can deceive – see the image below to get an impression of how tiny this toy gadget really is! Ok – so its shorter than the length of my thumb, but without going into detail about how long my thumb is you get the picture – shocking isn’t it! 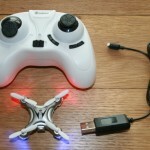 How do you fly the nano drone? Flying the drone indoors is really simple. Once you have inserted batteries into the hand controller (in this case 2 AAA) switch on the Drone. Then, place the left joystick on the controller down fully and switch on the controller. Move the left stick UP fully, then DOWN fully and there is a beeping noise. When you move the left stick up next time, the drone will take off. Steering is performed using the other stick, and there are two buttons on the face of the control. One is for start/stop video recording (a small LED light flashes on the drone body when recording video at 720p) and the other is to snap a photo. 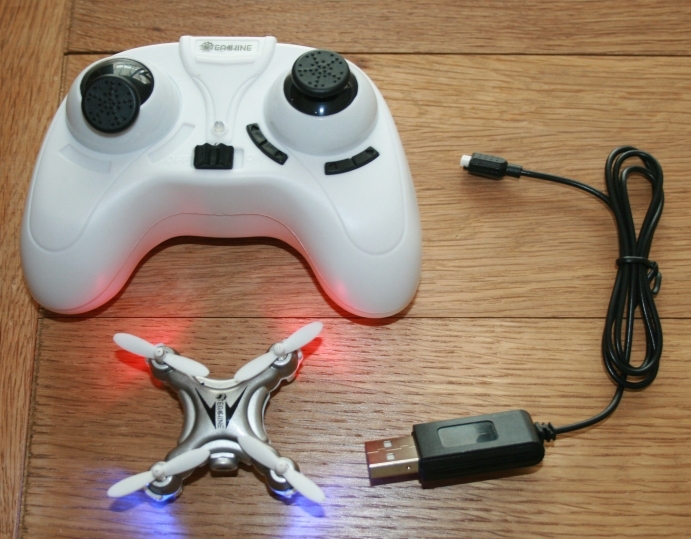 These are stored onto a memory card which you will have previously inserted and does not come with this quadcopter. The rest is down to personal practice. You WILL crash the drone until you get used to how it handles, but take a look at my video below which was produced in the extremely confined space of my living room. You will see that even after just 4 flights I have enough control to manouver it around the fireplace – navigating forward and backwards, side to side and also up and down. Charging the battery takes around half an hour and about 10 mins MAX flying time is attained with one charge. As the battery power drops down, the drone simply has some difficulty in gaining or retaining height – so you know when to bring it down. It also comes supplied with four spare propellers – incase of a nasty bump!! Overall, for a toy this is a great item – kids will need to take care not to fly it dangerously though and below a certain age they will not be sufficiently accurate with the nudging of the hand held controller sticks to maintain a good hover as it flys. For the money this is well worth it. Lets take a quick look at the video it can produce.